The objective of this project was to update this 90’s kitchen with on trend fixtures and finishes. Our challenge in this renovation was to eliminate all the ill functioning aspects of the kitchen while giving the space a fresh new look.The terra cotta styled tile floor was replaced with rich wood flooring. 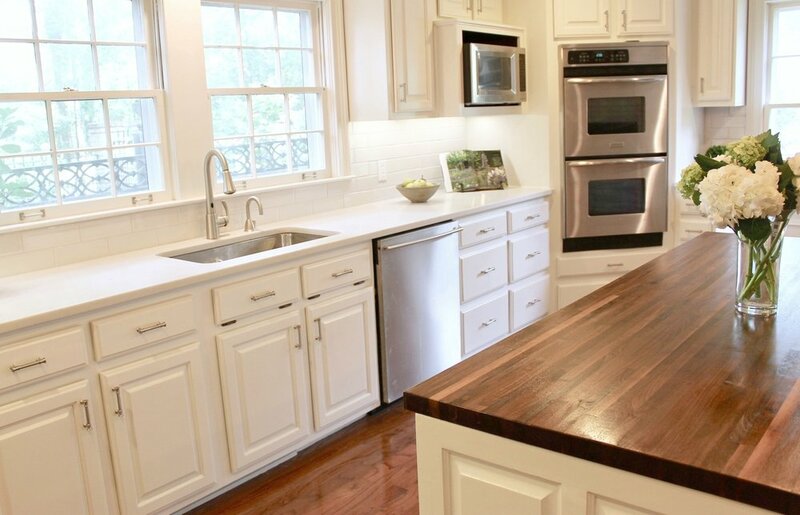 The existing dark cherry stained cabinets were painted a soft white. Additional cabinets were added to give the counter space to the left of the range and enclose the refrigerator. The dark granite counters were replaced with white quartz on perimeter cabinets, while the island was topped with a butcher block countertop, which was stained to match the new hardwood floors. The island was reconfigured to accommodate three counter stools oriented toward the windows over the sink. The hardware in this kitchen was updated with hidden, slow close hinges and brushed nickel pulls. 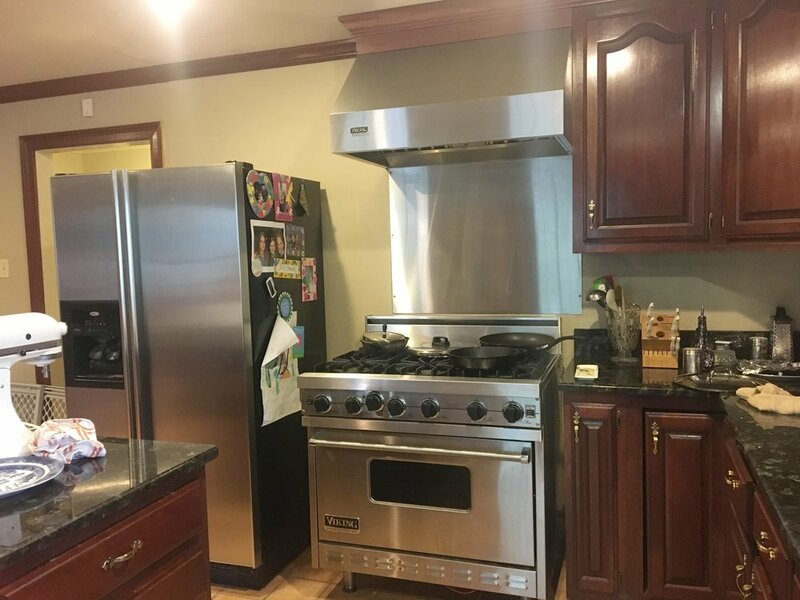 The kitchen sink was replaced with a 40/60 stainless, under mount sink along with a touch activated stainless faucet and instant hot water dispenser. The TV was relocated from over the fireplace to a new custom built in cabinet above the new stainless French door refrigerator. Lighting was also enhanced with two pendant lights over the island and under cabinet lighting over the subway tile back splash. The red brick hearth was painted the same white color as the cabinets and trim, which lightened and updated the entire space. The fireplace was equipped with a gas starter for the installation of gas logs.